Black-throated Sparrow observed along the David Yetman Trail in the Tucson Mountains, Pima Co., Arizona, USA, on 21 Feb. 2010. A beautiful little bird that can sing beautifully too. Common throughout desert habitats of the southwestern United States and ranging into Mexico. 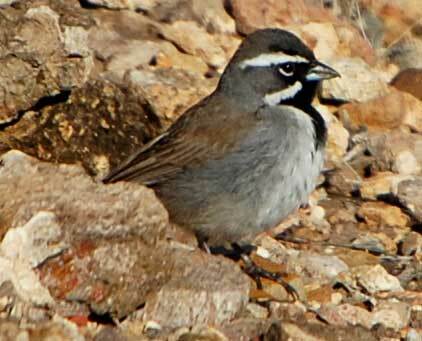 The jet-black throat and two contrasting white facial stripes are distinctive. 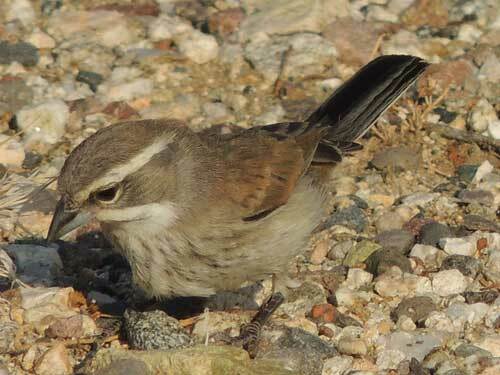 Black-throated Sparrows are seed feeders as indicated by the conical, seed-cracking beak. They also take a lot of sprouting seeds that emerge in abundance after rains. Once there are nestlings that need to be fed these sparrows like a majority of song birds gather insects. Opportunistic breeders, they respond to periods of good rainfall in spring or fall that are likely to yield sufficient insect prey upon which to rear the nestlings. Juvenile fledgling birds can be seen in late spring or mid summer after such favorable weather. Immature birds lack the characteristic black throat, but are otherwise similarly plumaged, and tend to feed in small groups together with adults. The bird below was found at White Tank Mountains in Maricopa Co., Arizona, 25 Aug. 2016.